Buy 15 boxes, Get 5 FREE! Offer ends 4/30/2019.Free goods will ship from Safco with your order. Net effective cost when you buy 15 boxes and get 5 free = 4.3¢ per glove. Strong and soft comfort during extended wear. Evolve 300 was evaluated by 43 consultants in 3,430 uses. The product received a 92% clinical rating. 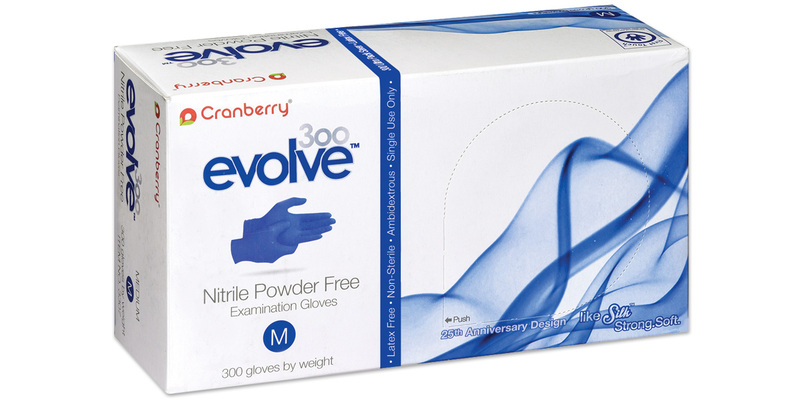 Evolve 300 is an ultra-lightweight, powder-free nitrile exam glove that combines high tensile strength with exceptional tactile sensitivity. Evolve 300 is designed with a silk-like softness that provides a bare hand feel that contours to the clinician’s hands. Textured fingertips provide both agility and dexterity, enhancing excellent grip, even in wet conditions. 300, and 86% would recommend it.